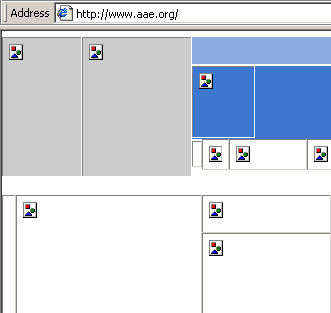 This morning I attended a SIG on Website Usability. Overall I thought it was run very well and really liked this approach because it brought in a lot of feedback from the audience. I suppose because the presenter, Sherry Budziak from .OrgSource, took examples from a few audience members and went over different elements of how each sites usability could be improved. There was two things at the end of the session that we ran out of time on that I didn’t really get to add my two cents for. One was custom error pages; which I will write another article about later. The other was a question by someone from American Association of Endodontists about improving their Google rank. They thought because they had too many images on their homepage and they weren’t getting ranked high enough in searches. The solution that was suggested to them was something to the effect of adding a banner of text that included the associations name. Well, let me tell you guys that might help a bit, but what you can do instead is go through all the images on your site (or have your vendor makes some changes in your CMS) and add alt text to all your images. This does a number of things. For one, it will make you one step closer to having a WC3 compliant site. Another is you’ll be one step closer to being 508 compliance. Lastly, and mostly importantly, google, yahoo, msn and other search bots will know what those images are because the alternative text (alt) will specifically tell them. Thus, this will eliminate have to modify the look and feel of your website trying to increase your search rank.